HotelSpa® Ultra Luxury 30 Setting 3-way Rainfall/Handheld Shower Combo features Multi-Function 6" Gray Face Rainfall Shower Head, Multi-Function 4"Gray Face Handheld Shower with Patented ON/OFF Pause Switch, 5 Foot Stailess Steel Hose and Water Diverter with Adjustable Bracket. Use two Showers Heads separately or use Showerhead and Hand Held Shower both together for a choice of 30 full and combined water flow patterns! • Use each shower head separately or both together! • Choose from 30 full and combined water flow patterns • 6-setting 6 inch Gray Face Rainfall Shower Head • 7-setting 4 inch Gray Face Handheld Shower with Patented ON/OFF Pause Switch • Settings of each shower include: Drenching Rainfall, Power Rain, Pulsating Massage, Stay-Warm Mist, Economy Rain, Pause, Rain/Mist, plus multiple combined settings • Economy rain and pause settings save water • High-power Precision SpiralFlo dial design • 3-zone Click Lever Dial with Rub-clean Jets • Patented 3-way Water Diverter with Anti-Swivel Lock Nut • Angle-adjustable Overhead Bracket • 5-7 foot Super Flexible Stretchable Stainless Steel Hose with Conical Brass Hose Nuts for easy hand tightening • Tools-free Installation. Connects in minutes to any standard overhead shower arm, no tools required • Lifetime Limited Warranty is provided by Interlink Products International, Inc. This warranty is void if the product has been purchased from an unauthorized distributor. 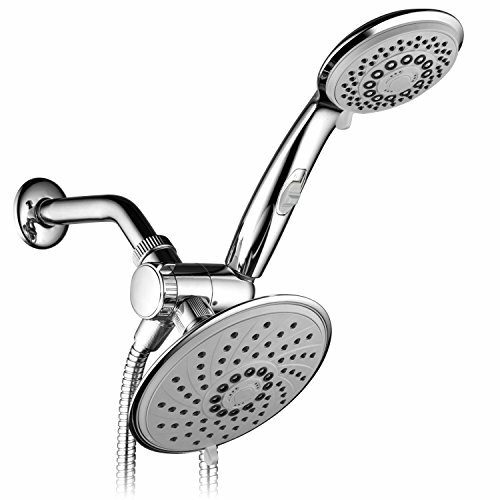 3 Way Multi-Function Rainfall Shower Head / Handheld Combo (Chrome Finish and Gray Face). Use two Showers Heads separately or use Rainfall Shower Head and Handheld Shower both together for a choice of 30 full and combined water flow patterns! Settings of each shower include: Drenching Rainfall, Power Rain, Pulsating Massage, Stay-Warm Mist, Economy Rain, Pause, Rain/Mist, plus multiple combined settings.